Hidden Charms and Timbre Concerts announced the return of Keithmas for a seventh consecutive year earlier this month, and now organizers behind the beloved West Coast event have detailed the lineup for the 2016 edition. Among the acts set to play are Bif Naked, Rich Hope, No Sinner, Pigby, the Rentalmen, La Chinga, Sister Morphine, the Orange Kyte and Greenback High. All the acts on hand will pay homage to the songs of the Rolling Stones in celebrating both six-stringer Keith Richards's birthday (December 18) and the Christmas holidays. 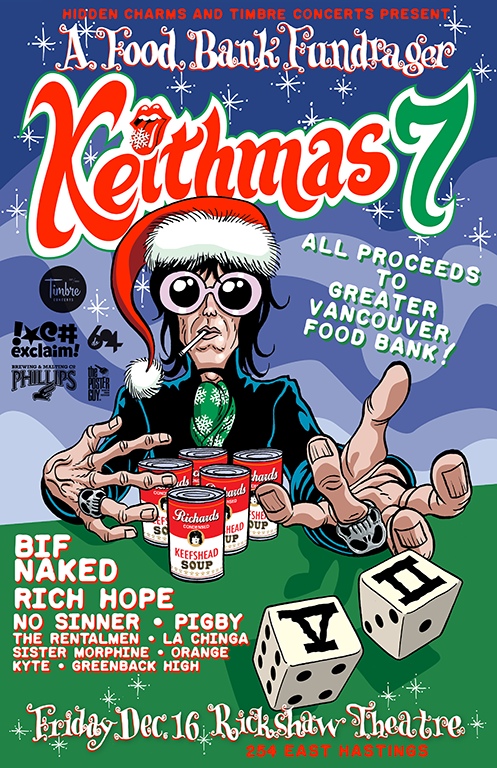 As previously reported, this year's instalment of Keithmas will take place at the Rickshaw Theatre in Vancouver on December 16. Doors will open at 7 p.m., with the show itself starting at 8 p.m.
Tickets are available for $15 plus service charges and can be purchased online here. They can also be purchased at Highlife Records, Neptoon Records, Red Cat Records and Zulu Records, or by phone at 1-888-732-1694. In charitable fashion, all proceeds will go the Greater Vancouver Food Bank. For further information on Keithmas 2016, keep an eye on the event's Facebook page.